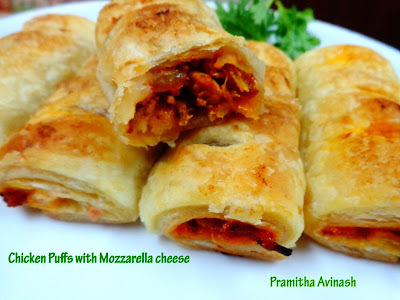 Puffs can be made with several types of filling. But my most favorite is this spicy chicken filled puffs. The filling can be mixed veggies, egg or meat.Crunchy chicken Puffs with a cup of tea in the evening...unbeatable!!!! 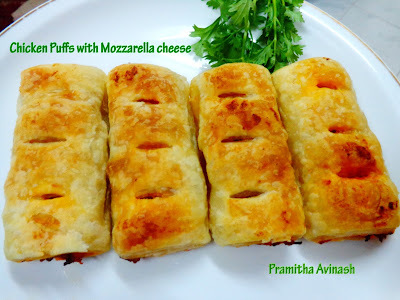 Puffs are my husband's all time favourite snack.He always missed the kerala style flaky puffs.So i thought of making for him at home.I came across the recipe for Chicken Puffs at savory and sweet food.But in her blog it was chicken pinwheel puffs,i made it as rolls.And i made slight changes to my recipe. 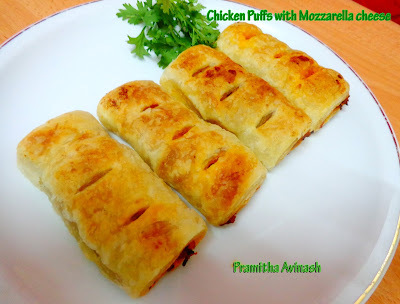 Mozzarella cheese gave extra flavour to the puffs and puffs turned out really well.Really i am very very happy that he loved the puffs a lot.These chicken puffs are light, crisp, flaky and spicy,an awesome starter for any occasion. 1.Clean and cut the chicken into medium size and cook the chicken with 1 tsp chilli powder, ¼ tsp turmeric powder,salt and required water until soft and tender. 2.Drain and shred the chicken. 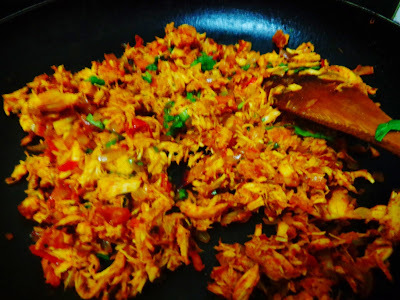 3.Heat oil in a non stick pan and add the chopped onion & salt and saute it till brown color, then add chopped ginger,garlic and green chilli sauté it for 3 mins.Then add the chopped tomato and sauté it till soft. 4.To this add turmeric powder,chilli powder and garam masala.Mix it and sauté it for a minute.Then add the shredded chicken,tomato sauce and chilli sauce.Stir fry for few minutes and finally add the chopped coriander leaves. 5.The puff pastry sheet needs to be thawed before using. So, either place into the refrigerator and leave overnight or remove and thaw at room temperature for 30 minutes. 6. If you are having sheet puff pastry roll,defrost and cut into 10 equal squares.I am using puff pastry squares. 7. 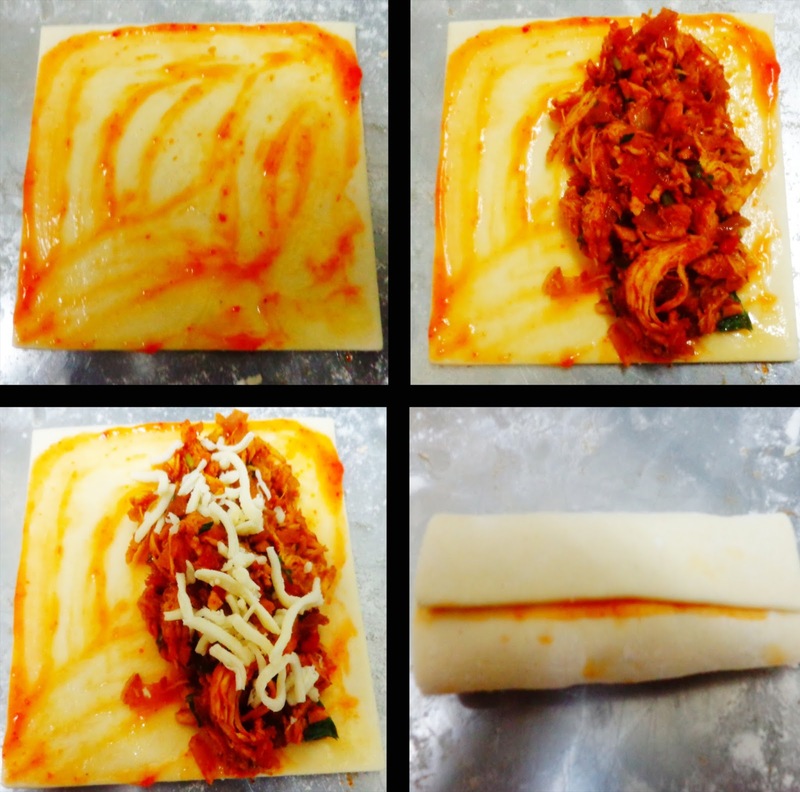 Cover work surface with flour and take each square puff pastry and brush with melted butter and then spread the chilli sauce over it.Then add the filling to one side then on the top of it add mozzarella cheese.Roll the pastry and lightly brush with egg wash or butter on each roll. 8.Make slits on the top of the puff pastry and place these on a lined baking sheet. 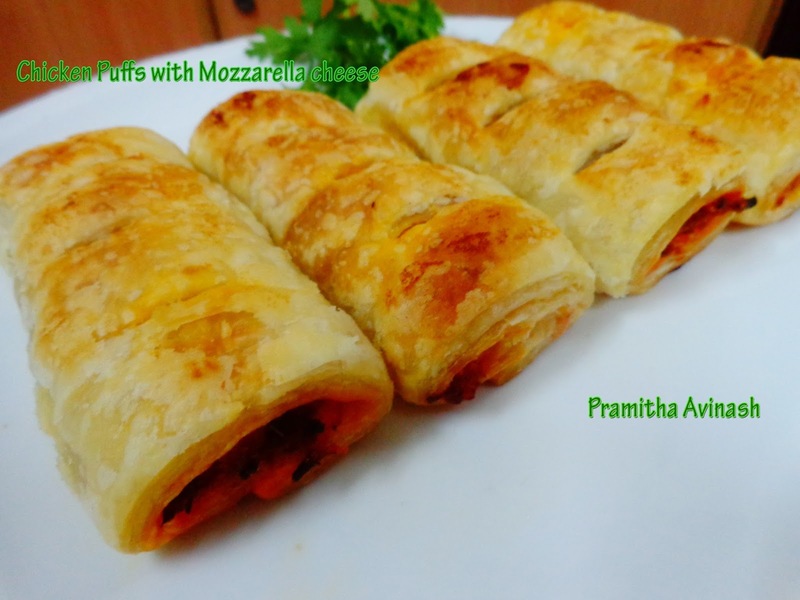 9.Preheat the oven to 220 degree C and bake it for 15 – 20 mins or until golden brown. Serve these delicious chicken puffs with a cup of tea. 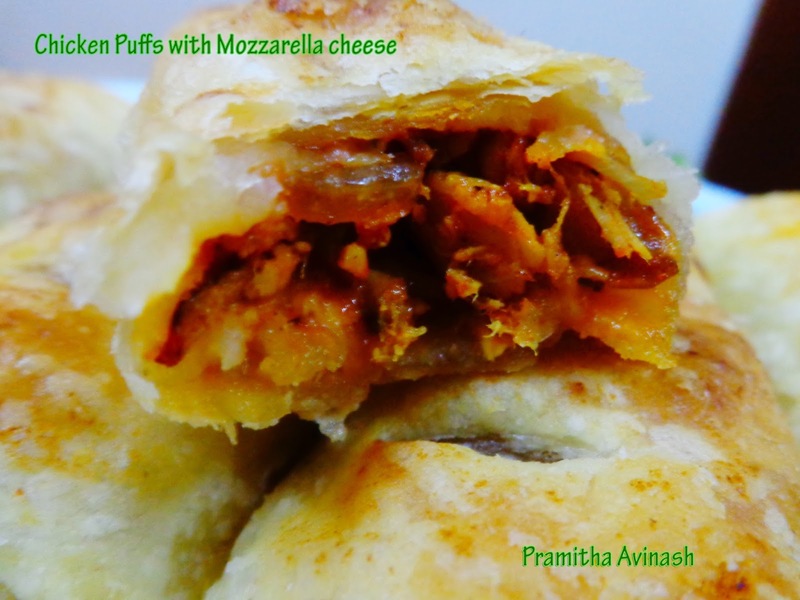 Cheese definitely gives a kick 2 the chicken flavor...yummy puffs!